As the days grow shorter and the temperatures begin to dip, builders all across Illinois are adjusting their services to account for any challenges brought on by the changing of the seasons. Installing drywall, for example, relies heavily on weather and humidity conditions to ensure a dry, stable result. Since 1999, our drywall contractors in Chicago have worked to perfect our services, from metal stud framing to drywall finishing and beyond. We can provide ideal results for businesses across many industries, relying on our expertise and top-notch training to meet a wide range of needs. We’re dedicated to providing the best outcome for your building, and our drywall installation services will focus on delivering dry, precise results. 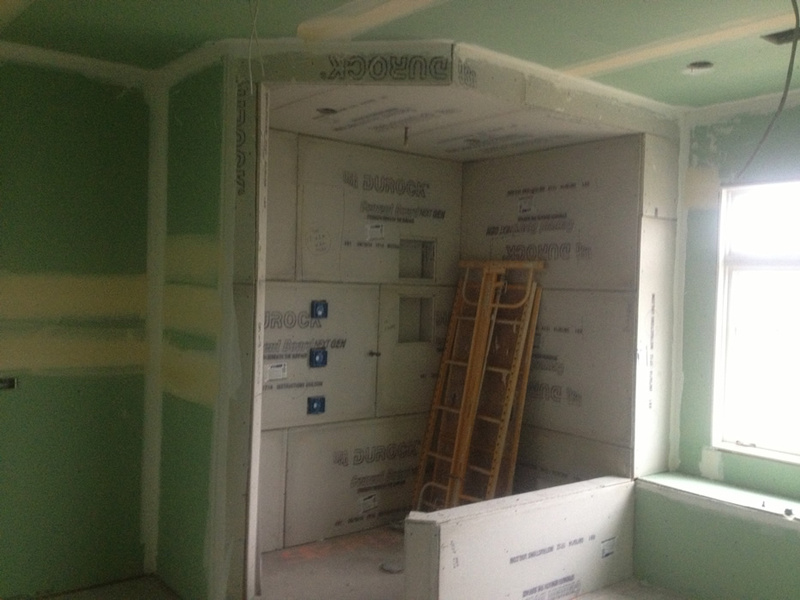 Moisture exposure is one concern our commercial drywall pros actively work to mitigate. While our last blog post featured the dangers of moisture exposure and the limits of gypsum versus moisture content, today’s content will focus more on measuring and assessing the extent of water damage. If you’re ready for quality results for your remodel, new addition, or complete build, be sure to contact us today! Oftentimes, visual cues will tip off building managers as to a problem within the drywall. Discoloration, staining, or bubbling can begin to occur in areas exposed to moisture over time. Crumbling, saturated surfaces are a sure sign of problems. Moisture can also reside within walls and insulation for long periods of time, creating ideal environments for mold to grow. Instead of visual cues, you may notice a musty smell emanating from a certain area within the building. Odors are more reliable signs of trouble over visual damages, but keep in mind that olfactory symptoms are often indicative of far worse problems behind the walls. Mold growth can create this unique smell, but only after considerable time has elapsed. Visual inspections are useful and can be performed by anyone, but keep in mind that these signs are only prevalent after damage has been done. In cases where heavy moisture levels are suspected, you may want to invest in a moisture meter. Using a moisture meter with a reference scale will be able to establish that there is moisture in your walls and will be able to give you a relative reading. 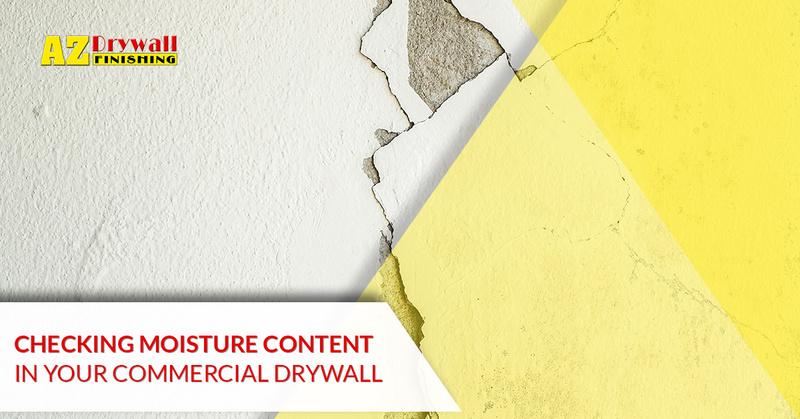 For the best readings, be sure to find a piece of drywall for reference that is dry. Measure the moisture content of this control piece and record the result. Then, move onto the area in question using this first number for comparison. Since drywall is inherently so dry, you will likely read very small amounts of moisture. However, even small changes can be indicative of problems, so be sure to take multiple readings around the area to obtain an average value. Reference meters are useful devices, but will not be able to deliver an exact measurement of the moisture content within your wallboard. You will also need to be careful in order to minimize mistakes from problems such as bad equipment readings, high levels of relative humidity, and more. Handheld devices featuring pins on the end can be applied to drywall scale applications, accurately measuring the moisture content in the process. Most moisture meters with this attachment can read values ranging from 0.1 percent to 6 percent, giving users plenty of leeway in determining how compromised their drywall is. Remember that any reading over one percent can doom your gypsum board, so be sure to check thoroughly when using this device! Drywall scale meters are perfect for fast, precise measurements. These devices can be used to assess the condition of your drywall, as well as look for any problem areas or future concerns. Proactive measures can do much to mitigate the damages and subsequent costs of drywall replacement and installation services. In order to achieve the best results for your building, you will need to find a commercial drywall company with the experience and training to take on all of your industry-specific building needs. Our drywall contractors in Chicago can deliver ideal results for your project, whether it be a new addition, complete structure, or anything in between. Contact us today to learn more about our drywall services, and be sure to request your free estimate!